The most popular swimming resource in triathlon is now new and improved. Swim Workouts for Triathletes, 2nd Ed. is the best-selling collection of swim workouts in triathlon. This waterproof book that triathletes can take to the pool helps triathletes make every lap count. The book is now available in bookstores, tri shops, and online. 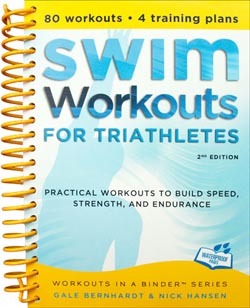 Triathletes and swimmers can download 5 free swim workouts at www.velopress.com/swim. It's no secret: Most triathletes are weak swimmers. Too many triathletes neglect their swimming form and rely on unfocused workouts. The result is lost time on race day. Swim Workouts for Triathletes features 80 freestyle swim workouts with the structure, variety, and drills triathletes need to become more efficient swimmers. Each workout is designed around a specific goal - endurance, speed, form, force, muscular endurance, or anaerobic endurance - making it easy to prepare for any race and improve all-around swimming skill. Gale Bernhardt is one of the most experienced and accomplished coaches in triathlon. She coached the U.S. triathlon teams for both the 2004 Olympics in Athens, Greece, and the 2003 Pan American Games, and she has served as a world cup coach for the International Triathlon Union development squad. Gale holds the highest certifications offered by USA Triathlon and USA Cycling. She is author of four VeloPress books for cyclists and triathletes. Over the course of his coaching career, Nick Hansen has been at the helm of some of the nation's most prestigious swimming programs: U.S. National Team swimming coach, University of Wisconsin head coach, University of Arizona assistant coach, and masters swim coach. Nick holds a graduate degree in exercise physiology and formerly served at the University of Wisconsin Sports Medicine Clinic.